Global biosensors market has proliferated from the rising occurrence of chronic and coronary diseases that result from increased physical inactivity and poor eating habits. Biosensors are capable of measuring and analyzing substances, then convert their biotic activity into quantifiable signals to allow for a convenient understanding of a medical condition. 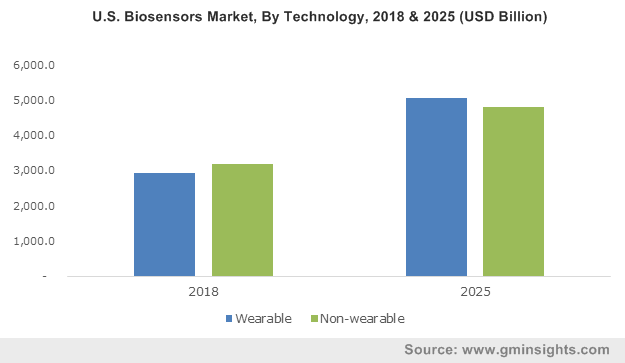 Diagnosis of several diseases ranging from diabetes, haemophilia, cholesterol to genetic mutations are being performed today using technically accurate biosensors, propelling earnings for the biosensors market which surpassed USD 17 billion in 2017. Improved awareness regarding the importance of monitoring blood pressure, heart rates and blood-glucose levels for tracking the progress of diseases has coerced people worldwide into using portable sensing instruments or in-hospital services. The severity of health conditions in developed countries is observed to be intensifying further, warranting a greater demand for the biosensors market in medical diagnostics. Referring to estimates from the World Health Organization (WHO), globally around 1.6 million deaths in 2015 were directly attributed to diabetes, while by the end of 2014 approx. 422 million people were diagnosed with the disease. As such, the biosensors industry has been developing and providing enhanced equipment to monitor the glucose levels in blood and to help regulate treatments. Consistent screening of blood-sugar can help to defer the consequences of diabetes in conjunction with proper diet and physical activity, making the biosensors market an integral part of the healthcare sector. Additional statistics from WHO reveal that obesity among adolescent population, aged between 5 to 19 years, has grown tenfold over the last four decades, whereas calculations show that by 2022 the number of obese adolescents will be more than the underweight ones. These figures indicate a huge requirement of blood screening equipment to support medical treatments and surgeries in the future, highlighting the growth potential of the biosensors market. Trending health improvement accessories and glucometers that monitor blood-glucose or sugar levels have helped patients to maintain glucose within a desired target range, although recent developments in the biosensors industry are presenting new avenues for easier glucose testing. The Saliva Glucose Biosensor from iQ is a revolutionary technology designed for measuring the glucose in saliva rather than in blood. The key benefit of this instrument is a non-invasive and pain-free method of testing saliva, allowing users to completely avoid finger-pricking for testing blood. The Saliva Glucose Biosensor involves placing a sensor strip on the tongue and after a few seconds, a connected smart device will display the glucose level reading. Users can track and compare historical glucose level data for better control and treatment of diabetes. With such convenient devices slated to encourage glucose monitoring among more diabetic patients in the future, the biosensors market is expected to undergo a tremendous upheaval in terms of technological advancement. The biosensors industry is propagated by its utility in not only monitoring medical conditions but also in industrial processing, agricultural and pollution control applications. Being able to detect the interaction between biological molecules, previously unmeasurable levels of harmful agents in the atmosphere can now me measured. For eliminating health hazards and avoiding damages to environment, precise monitoring and removal of contaminants from water, air and soil can be achieved rapidly at low costs using biosensors. BOD biosensors are an example of detection devices applied in sensing pollutants or toxics in water sources and represent a successful progression of the biosensor market in environmental monitoring. Scientifically, Biochemical oxygen demand (BOD) is the quantity of molecular oxygen required by microorganisms to thrive in wastewater and is typically essential during the break down of organic compounds. Biosensors made for effective BOD level monitoring to determine the BOD value for different wastewater or sewage sources are essential in deploying proper treatment processes. As with the healthcare segment, the biosensors industry has witnessed innovations in pollution control devices also, that have commercialized their application. Earlier in the year, Enova, a Bulgarian startup, was awarded for its new BOD monitoring system built using the latest generation of biosensors which can measure the organic pollution within water in only 5 minutes, as compared to 5 days taken by other conventional techniques. The system is suitable for monitoring lakes, rivers or wastewater treatment facilities and the company will also allow for remote data access and real-time tracking. With the world on the verge of environmental crisis and many countries anticipating water shortages, adoption of biosensors in water sustainability solutions will reinforce the biosensors industry. Combined with the wide range of advantages in monitoring infectious and chronic diseases for active control, the biosensors market will record an impressive 8% CAGR from 2018 to 2024. Bio-Rad International, DuPont Biosensors Materials, Biosensors International, Abbot Laboratories, Siemens Healthcare, Innovative Biosensors and Roche Diagnostic are some players forming the competitive hierarchy of biosensors industry.